Windows 7 SP1, PowerShell versions 3, 4 and 5 all work with Word versions 2010, 2013 and 2016. Windows 8.1, PowerShell versions 4 and 5 all work with Word versions 2010, 2013 and 2016. 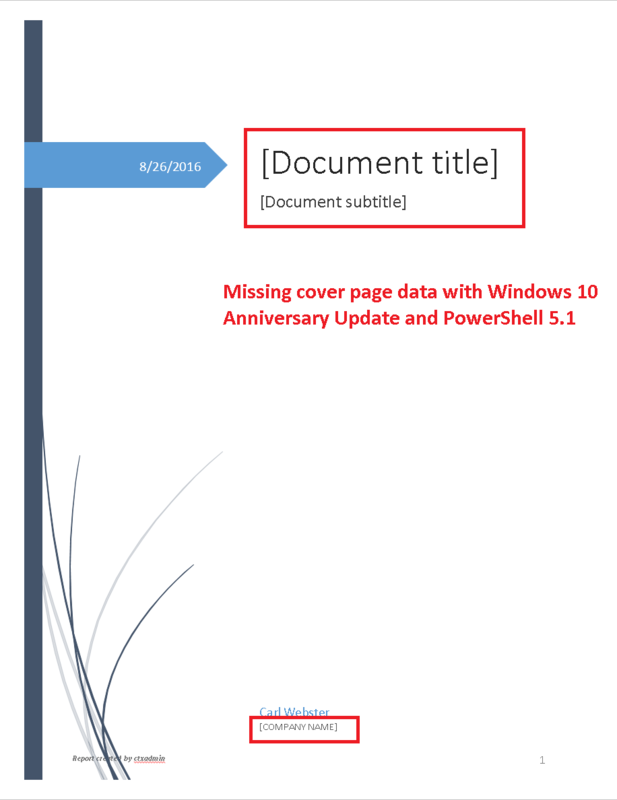 Windows 10 prior to AU, PowerShell version 5.0 works with Word 2010 and 2013. Windows 10 AU, PowerShell version 5.1 no version of Word works. Word 2016 is not working on any Windows 10 release. This is only for the Cover Page. Everything else in the Word/PDF report works. I have only tested the en-US cover pages. I am assuming the other ten languages the scripts support have their cover pages broken also. I have no idea how to fix the Cover Page. The code came from Jeff Hicks back in late 2012 and has not been touched since. I have reached out for help, so maybe someone who understands comObjects can help me out. Maybe the PowerShell team inadvertently broke something with comObjects with PowerShell version 5.1 (specifically 5.1.14393.82) . Maybe I can hope they issue a fix. It would also be great to figure out why Windows 10, all releases, broke Word 2016 Cover Pages. Maybe Jeff Hicks will see this and maybe he knows the answer(s).